Cool stamps are not always easy to find. I mean, you could always create and print your own photo stamps. But if you just want to drop by the post office and buy some cool stamps- well, you'll usually be disappointed. That is until now! 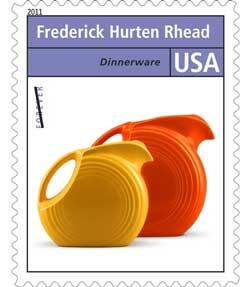 On Wednesday the USPS unveiled a new series of stamps honoring 12 giants of industrial design. The Pioneers of American Industrial Design series includes influential designers like Henry Dreyfuss, Norman Bel Geddes and Raymond Loewy. Even the border of the stamp pane (or selvage as it's known in philatelic circles) is adorned with the classic Airflow house fan- as seen in the recent American Streamlined exhibit at Tulsa's Philbrook Museum! Each stamp features the name of a designer and a photograph of an object they created, as well as a description and year the object was created. To learn more than you ever wanted to know about stamp collecting (including what "selvage" means) visit our featured favorite, Beyond the Perf. 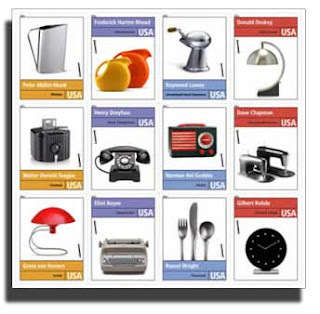 The official site for USA stamp collecting developed to bring you in-depth information about stamps, cancellations, and related events.